"Play with us, mon," the barefoot local said as we walked up to the first tee at Kukuiolono, a 9-hole golf course on the island of Kauai in Hawaii. Golf on Kauai usually costs big bucks, but this public course only charges $7 to play during the week and $9 on the weekend. It's tough to beat any round of golf at that price. 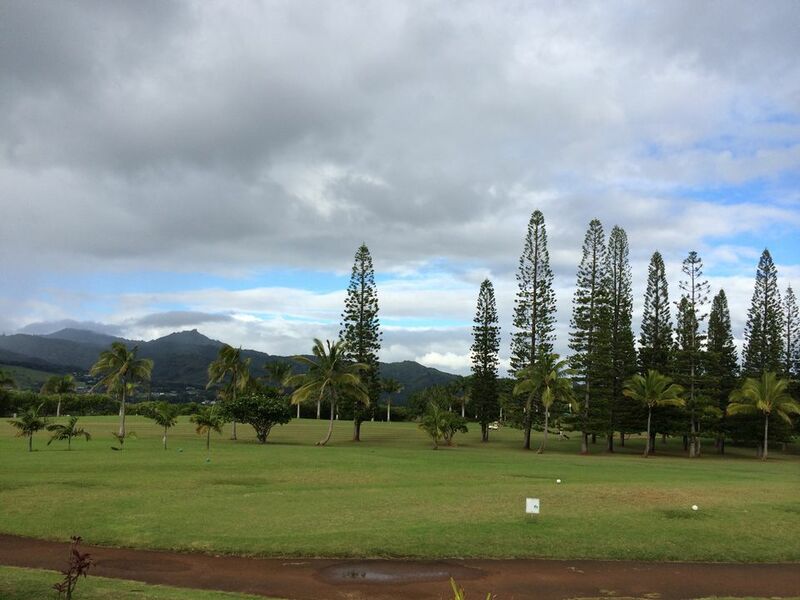 Our visit to Kukuiolono was quite a change from the day before, when we played the Prince Course in Hanalei While paying greens fees and for a $3 handcart at Princeville, we overheard the folks behind us muttering about their round at "the unfair course" they played the day before. Looking at the golfer's legs, you could see that he had tried to find his lost golf balls in the thorny bushes alongside the fairways that the Prince Course is known for, not something I'd recommend for most people. We laughed our way through nine holes, mostly thanks to the funny (and on point!) comments from our local golf guides. My best shot (at least in terms of laughs) was a ball that flew right into the coconut tree on the second hole, which was already decorated with white, yellow, pink and orange golf balls. Obviously I wasn't the first person to take a shot at that landmark. The course is perched on a hilltop overlooking the ocean, which can be seen from about a mile away. If you're a beginner, you'll love the wide fairways, which are very forgiving of errant shots. More experienced golfers may not find this course to be much of a challenge, but it certainly is a lot of fun. This is due in no small part to the fact that there are no rangers pushing you along if you stop to take in the views or spend a minute more than the allotted time per hole on the more expensive courses. Expect wind sweeping over the terrain, lots of trees, a few fairway hazards, and maybe a wild chicken or two pecking at the greens. You know – exactly like the conditions on your local course back home. Why Cheap Golf on Kauai, Hawaii? You might think cheap golf on this island is an oxymoron, when so many courses cost $100 to $200 or more to play. Here, it's just $9 for the right to play all day. (Plus $3 for a hand cart or $9 for a gas cart.) That means you can stay as long as you want, and play as many rounds as you'd like too. It's hard to pass up a deal like that one, even if golf isn't particularly high on your list of things to do while visiting Hawaii. Thank Walter McByde, the son of Duncan McBryde who developed this land after leasing it from King Kamehameha III in 1860. He's responsible for keeping the prices down even in the 21st century. Walter, a sugar magnate and golf fanatic, later bought the estate and built the golf course on it in 1929. When he died in 1930, he donated it to the state of Hawaii because he wanted the locals to have a course they could afford to play. Walter loved golf so much that he requested that he be buried on the course not far from the 8th hole. That request was honored, and you can still see his gravesite there when you pass by even to this day. All told, there are 10 golf course to be found on Kauai, some of which are world class in terms of design and challenge. Both Jack Nicklaus and Robert Trent Jones, Jr. have built courses on the island, with numerous PGA pros dropping by to play a round or two when they're visiting the area as well. In other words, Kauai is a golfers paradise, with Kukuiolono offering a much-appreciated reprieve from the higher priced courses found elsewhere. Sure, most of the others have better amenities, but it is tough to beat Kukuiolono in terms of just plain fun. Contact Info for Kukuiolono, Kauai, Hawaii? To learn more visit Kukuiolono. To learn about more adventures in the Hawaiian Islands visit GoHawaii.com.